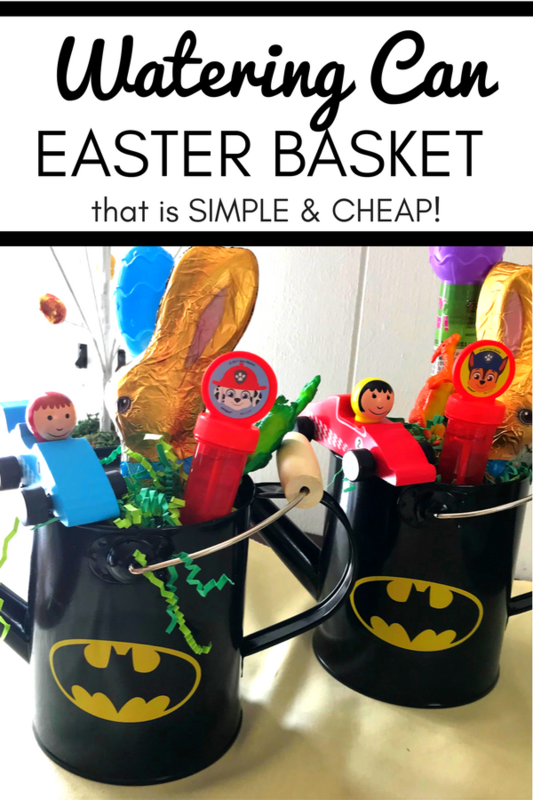 Looking for a simple and cheap Easter basket idea that is practical and useful for your little one? 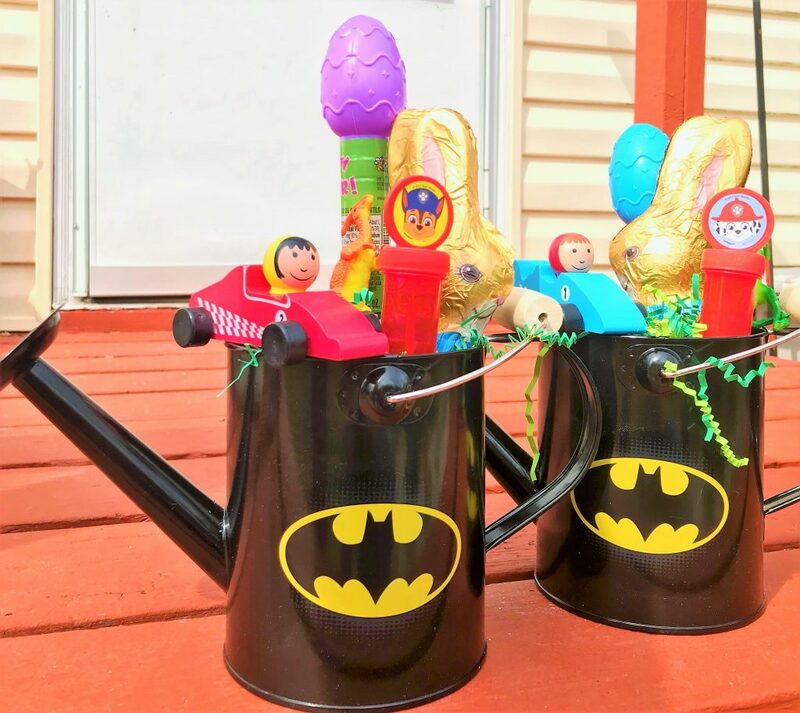 This watering can Easter basket is the perfect solution. Read on to find out how we did it! Even though my boys are just turning 3-years-old this Monday, the day after Easter, this is actually their 4th Easter Sunday. They were born on April 2nd, 2015, the Thursday before Easter, and we brought them home on Easter Sunday, April 5th. They celebrated their 1st Easter on their 4th day of life. I didn’t want any useless green plastic baskets laying around the house after Easter. The container had to be useful and multi-functional. I didn’t want a lot of toys in their baskets. 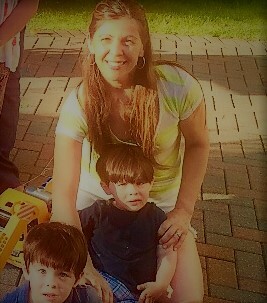 The boys have plenty and don’t need more, and we really don’t need more clutter around our already-small house. I wanted a fun basket, but nothing so big and grandiose that it would distract them from the real meaning of Easter (which, I know, they are too little to understand. However, I didn’t want them to be excited about Easter for the wrong reasons down the road – you know, pre-conceived expectations and all). Therefore, I was on the hunt, and here is what I finally came up with. I thought these watering cans were perfect: they boys love playing with watering cans in the tub and in the backyard (and I’m hoping to get some helpers to water my flowers out of the deal!). They weren’t too big that I would be forced to stuff them with too much candy or too many toys. And, it wasn’t so extreme that they would start to see the Easter Bunny like a fluffy Santa. The watering cans came from Target, on sale for $5 each. They also had Peppa Pig, Mickey Mouse and other superheroes versions. In the dollar section, they had a $3 version of some cute metal watering cans as well. I really loved the blue garden gnome can for the boys, but they only had one – and we all know that would never fly with twins! Also, those didn’t have the partial covering on top, which I like for spill prevention purposes. I filled the bottom of the bucket with plastic eggs to prop up the other items. 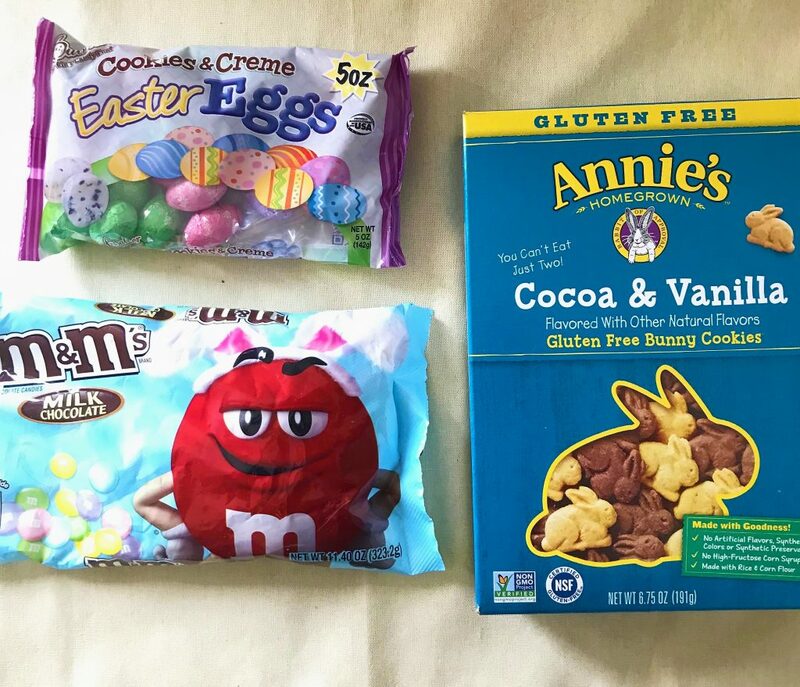 In the eggs, I placed a few spring M&Ms ($3), a few chocolate eggs (from Dollar Tree) and some Annie’s Organic Cocoa and Vanilla Bunny Cookies ($2.50). Also from Target, I got them each a wooden racer from the dollar section ($1 each). As for filling the watering can, I got the boys each a small, hollow chocolate bunny. Those were around $3.79 each when I bought them, but I probably could have gotten them cheaper if I shopped around. I wanted hollow because it would be easier for them to eat, and less chocolate! At Target, I spent a total of about $25. 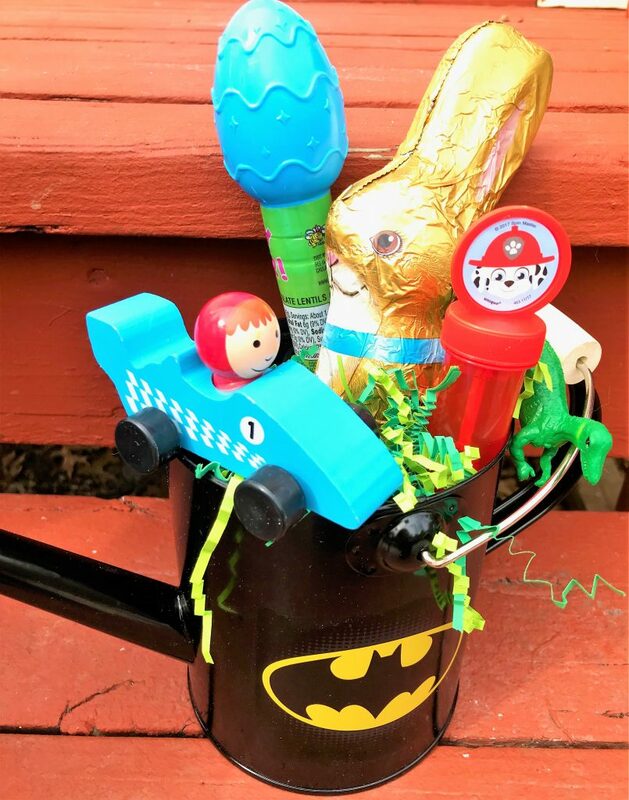 Then, I picked up a few things from Dollar Tree: a 2-pack of Paw Patrol bubbles, 2 grow-in-water dinosaurs, the bag of chocolate eggs, and 2 egg shaker candy sticks (the boys really like playing with them and filling them with all sorts of things once they are emptied out). I also got the bag of plastic eggs as well as the crinkly grass, for a total of $8. For both baskets, I spent approximately $33. Pretty good for 2 Easter baskets! You don’t have to get crazy or go over the top for Easter. It’s totally fine to enjoy our American Easter traditions, but we don’t want to make such a big deal over them that we overshadow the real reason for Easter. I was going for a simple and cheap Easter basket, and I think we scored on this one! Happy Easter! Happy Resurrection! He is Risen!!! 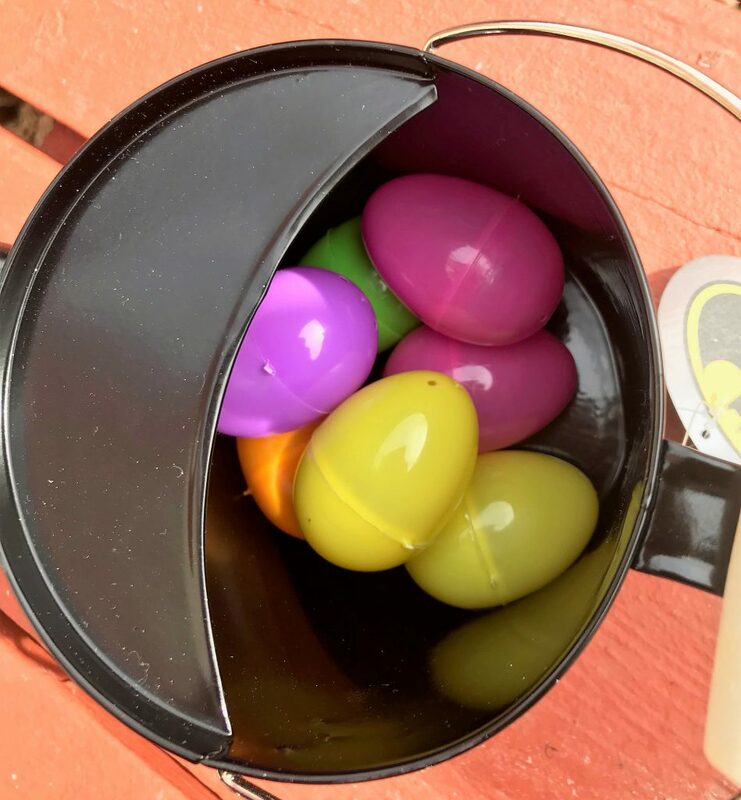 If the watering cans didn’t quite work for you and you are looking for more Easter basket ideas, check out 45 Creative Easter Basket Ideas! 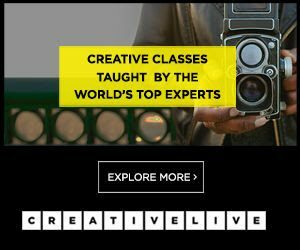 What clever ideas have you come up with? I’d love to see! If you think others might enjoy this, I’d be grateful if you shared! « Healthy Yogurt Breakfast Bars that Your Picky Toddler Will Love!